The major Biblical Covenants of the Holy Bible are mostly between God and Israel. This study, then, is not occupied with the covenants contained in Reformed Theology, but rather with the determinative covenants set forth in the Scriptures. The covenants of God contained in Scripture fall into two classes, those that are conditional and those that are unconditional. A conditional covenant is one in which God’s action is in response to some action on the part of those to whom the covenant is addressed. A conditional covenant guarantees that God will do Him part with absolute certainty when the human requirements are met, but if man fails, God is not obligated to fulfill His covenant. An unconditional covenant, while it may include certain human contingencies, is a declaration of the certain purpose of God, and the promises of an unconditional covenant is distinguished from a conditional covenant by the fact that its ultimate fulfillment is promised by God and depends upon God’s power and sovereignty. There are eight biblical covenants given in the Bible. They are: Edenic (Genesis. 2:16); Adamic (Genesis. 3:15; Noahic (Genesis 9:16); Abrahamic (Genesu 12:2); Mosaic (Exodus 19:5); Palestinian (Deuteronomy.30:3); Davidic (2 Samuel. 7:16); and New Covenant (Jeremiah 31:31-34). Six are unconditional and two are conditional. In our study we will determine which are conditional and which are unconditional. Although covenants in the Ancient Near East could have parity between parties (such as agreements between Hittites and Egyptians), covenants in the Torah were generally one-sided. However, covenants can either be conditional or unconditional in the Torah. Some appear to have the form of a Suzerainty treaty where there are clear stipulation to be upheld by both parties involved, but other covenants do not have stipulations and represent a divine charter or gift. As an example see the Abrahamic Covenant below that can involve both conditional and unconditional covenants. GotQuestions: What are the covenants in the Bible? GotQuestions: What is the Edenic Covenant? The Adamic Covenant was made with man after the fall. This is the covenant in which God declares to man what his lot in life will be because of his sin. There is no appeal allowed, nor is any human responsibility involved. GotQuestions: What is the Adamic Covenant? Throughout history, we are told that the serpent beguiled Eve and deceived her into eating the forbidden fruit of the Tree of Knowledge of Good and Evil. Paul the Apostle said, “Let a woman learn quietly with all submissiveness. I do not permit a woman to teach or to exercise authority over a man; rather, she is to remain quiet. For Adam was formed first, then Eve; and Adam was not deceived, but the woman was deceived and became a transgressor” (1 Timothy 2:11-14 ESV). Clearly Eve was deceived and Adam choose to participate in her transgression because of his love for her. The serpent never deceived Adam. The serpent which was used of Satan was cursed for his actions. The Genesis natative says, The LORD God said to the serpent, “Because you have done this, cursed are you above all livestock and above all beasts of the field; on your belly you shall go, and dust you shall eat all the days of your life” (Genesis 3:15). Although the disobedience had brought a curse upon themselves and all future generation, God promised them a redeemer. “I will put enmity between you and the woman, and between your offspring and her offspring; he shall bruise your head, and you shall bruise his heel” (Genesis 3:15 ESV). This is both the first prophecy in Scripture and it refers to the Virgin Birth of the coming Messiah (women have no seed). Due to sin, mankind will henceforth earn his bread by the sweat of his brow. “And to Adam he said, “Because you have listened to the voice of your wife and have eaten of the tree of which I commanded you, ‘You shall not eat of it,’ cursed is the ground because of you; in pain you shall eat of it all the days of your life; thorns and thistles it shall bring forth for you; and you shall eat the plants of the field. By the sweat of your face you shall eat bread, till you return to the ground, for out of it you were taken; for you are dust, and to dust you shall return” (Genesis 3:17-19 ESV). Furthmore, mankind’s life will be one of sorrow and ultimate death. “By the sweat of your face you shall eat bread, till you return to the ground, for out of it you were taken; for you are dust, and to dust you shall return” (Genesis 3:19 ESV). Paul the Apostle said, “But God, being rich in mercy, because of the great love with which he loved us, even when we were dead in our trespasses, made us alive together with Christ–by grace you have been saved– and raised us up with him and seated us with him in the heavenly places in Christ Jesus, so that in the coming ages he might show the immeasurable riches of his grace in kindness toward us in Christ Jesus. The Noahic Covenant the promise that God made to Noah and his descendants after the flood which destroyed the world. The Noahic Covenant has several distinguishing features. First, it is an unconditional covenant. Second, it was made to Noah and all his descendents as well as “every living creature” and the earth in general Third, it was sealed with a sign, the rainbow. GotQuestions: What is the Noahic Covenant? This covenant, while repeating some of the features of the Adamic covenant, introduced a new principle of human government as a means to curb sin. It revealed God’s purpose for the race subsequent to Noah. The normal order of nature was reaffirmed. “While the earth remains, seedtime and harvest, cold and heat, summer and winter, day and night, shall not cease” (Genesis 8:22 ESV) and “The fear of you and the dread of you shall be upon every beast of the earth and upon every bird of the heavens, upon everything that creeps on the ground and all the fish of the sea. Into your hand they are delivered” (Genesis 9:2 ESV). Mankind (and animals) were no longer vegetarian. God gave us permission to eat their flesh. “Every moving thing that lives shall be food for you. And as I gave you the green plants, I give you everything. But you shall not eat flesh with its life, that is, its blood” (Genesis 9:3-4 ESV). The Abrahamic Covenant is one of the great revelations of God concerning future history, and in it, profound promises were given. It is the first theocratic covenant (pertaining to the rule of God). God told Abram to do three things: 1) To get out of his city and country; 2) To separate himself from his family; and 3) To go to a land that He would show him. There were four promises that God made to Abram: 1) He would become the father of a great nation; 2) He would be blessed and his name would be great; 3) God would bless those who blessed him and curse those who cursed him; and 4) All the families of the earth would be blessed in him. The Mosaic Covenant was given through Moses for the children of Israel. It was a conditional covenant and embodied the principle that if Israel was obedient, God would bless them, but if Israel were disobedient, God would course and discipline them. The Mosaic covenant was also temporary and would terminate at the cross of Christ. It is the second theocratic covenant. GotQuestions: What is the Mosaic Covenant? Now therefore, if you will indeed obey my voice and keep my covenant, you shall be my treasured possession among all peoples, for all the earth is mine; and you shall be to me a kingdom of priests and a holy nation. These are the words that you shall speak to the people of Israel.” So Moses came and called the elders of the people and set before them all these words that the LORD had commanded him. All the people answered together and said, “All that the LORD has spoken we will do.” And Moses reported the words of the people to the LORD. The Palestinian Covenant was both a conditional and an unconditional covenant regarding Israel’s final possession of the land. Ownership of the land is unconditional. It is the third theocratic covenant. GotQuestions: What is the Palestinian Covenant? This covenant came after the Mosaic Covenant and after Israel had wandered in the wilderness for forty years until the generation that had refused to enter the Promised Land had passed away. God made this covenant with Israel while they were in Moab waiting to go into the Promised Land, and the covenant would serve this new generation of Israelites as a reminder of their special covenant relationship with God. The Davidic covenant was an unconditional covenant in which God promised David an unending royal lineage, a throne, and a Kingdom, all of them forever. It is the fourth theocratic covenant. GotQuestions: What is the Davidic Covenant? Now when David lived in his house, David said to Nathan the prophet, “Behold, I dwell in a house of cedar, but the ark of the covenant of the LORD is under a tent.” And Nathan said to David, “Do all that is in your heart, for God is with you.” But that same night the word of the LORD came to Nathan, “Go and tell my servant David, ‘Thus says the LORD: It is not you who will build me a house to dwell in. For I have not lived in a house since the day I brought up Israel to this day, but I have gone from tent to tent and from dwelling to dwelling. In all places where I have moved with all Israel, did I speak a word with any of the judges of Israel, whom I commanded to shepherd my people, saying, “Why have you not built me a house of cedar?”‘ Now, therefore, thus shall you say to my servant David, ‘Thus says the LORD of hosts, I took you from the pasture, from following the sheep, to be prince over my people Israel, and I have been with you wherever you have gone and have cut off all your enemies from before you. And I will make for you a name, like the name of the great ones of the earth. And I will appoint a place for my people Israel and will plant them, that they may dwell in their own place and be disturbed no more. And violent men shall waste them no more, as formerly, from the time that I appointed judges over my people Israel. And I will subdue all your enemies. Moreover, I declare to you that the LORD will build you a house. When your days are fulfilled to walk with your fathers, I will raise up your offspring after you, one of your own sons, and I will establish his kingdom. He shall build a house for me, and I will establish his throne forever. I will be to him a father, and he shall be to me a son. I will not take my steadfast love from him, as I took it from him who was before you, but I will confirm him in my house and in my kingdom forever, and his throne shall be established forever. '” In accordance with all these words, and in accordance with all this vision, Nathan spoke to David. The New Covenant prophesied in the Old Testament was partially fulfilled in the Church (a mystery – Acts 15:6-16, Ephesians 3:1-7), but will have a final fulfillment in the millennial kingdom. This is an unconditional covenant and is the fifth theocratic convent. GotQuestions: What is the New Covenant? For this reason I, Paul, a prisoner for Christ Jesus on behalf of you Gentiles– assuming that you have heard of the stewardship of God’s grace that was given to me for you, how the mystery was made known to me by revelation, as I have written briefly. When you read this, you can perceive my insight into the mystery of Christ, which was not made known to the sons of men in other generations as it has now been revealed to his holy apostles and prophets by the Spirit. This mystery is that the Gentiles are fellow heirs, members of the same body, and partakers of the promise in Christ Jesus through the gospel. Of this gospel I was made a minister according to the gift of God’s grace, which was given me by the working of his power. The new covenant guarantees all that God proposes to do for men will be on the grounds of the shed blood of His Son. will save, preserve, and present in heaven, conformed to His Son, all who have believed and received Christ and the future salvation of Israel is promised under the unconditional new covenant. I wish you would bear with me in a little foolishness. Do bear with me! For I feel a divine jealousy for you, since I betrothed you to one husband, to present you as a pure virgin to Christ. But I am afraid that as the serpent deceived Eve by his cunning, your thoughts will be led astray from a sincere and pure devotion to Christ. Christ redeemed us from the curse of the law by becoming a curse for us–for it is written, “Cursed is everyone who is hanged on a tree”– so that in Christ Jesus the blessing of Abraham might come to the Gentiles, so that we might receive the promised Spirit through faith. To give a human example, brothers: even with a man-made covenant, no one annuls it or adds to it once it has been ratified. Now the promises were made to Abraham and to his offspring. It does not say, “And to offsprings,” referring to many, but referring to one, “And to your offspring,” who is Christ. This is what I mean: the law, which came 430 years afterward, does not annul a covenant previously ratified by God, so as to make the promise void. For if the inheritance comes by the law, it no longer comes by promise; but God gave it to Abraham by a promise. Why then the law? It was added because of transgressions, until the offspring should come to whom the promise had been made, and it was put in place through angels by an intermediary. Now an intermediary implies more than one, but God is one. Is the law then contrary to the promises of God? Certainly not! For if a law had been given that could give life, then righteousness would indeed be by the law. But the Scripture imprisoned everything under sin, so that the promise by faith in Jesus Christ might be given to those who believe. Now before faith came, we were held captive under the law, imprisoned until the coming faith would be revealed. So then, the law was our guardian until Christ came, in order that we might be justified by faith. But now that faith has come, we are no longer under a guardian, for in Christ Jesus you are all sons of God, through faith. For as many of you as were baptized into Christ have put on Christ. There is neither Jew nor Greek, there is neither slave nor free, there is no male and female, for you are all one in Christ Jesus. And if you are Christ’s, then you are Abraham’s offspring, heirs according to promise. 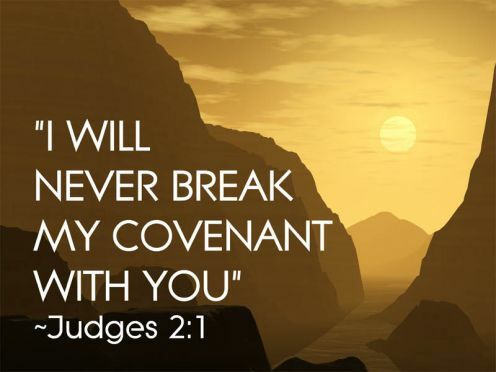 I will make you pass under the rod, and I will bring you into the bond of the covenant.